Wednesday night was a great night of music - and two kinds of music. Our friends the Sierra's oldest son is graduating from UT in May with a degree in Jazz Performance. As part of that program he had a Student Recital early Wednesday evening in Bates Hall on the UT campus. First off, what a beautiful room for music, the acoustics were perfect. David is an exceptional drummer and even though I don't profess to be a jazz afficionado it was a really nice set. Four songs were played with David on the drums along with fellow music majors on stand-up bass and electric guitar really highlighted the relaxing effect of Jazz. Songs by John Coltrane and Henry Mancini were followed up by an original song of his that he played on the piano and sang on. I continue to be amazed by the ability to change instruments and still be a great musician - I guess it's kind of the same as going from the basketball court to the baseball diamond which I can at least relate to! Still, it would be nice to be able to play more than the opening bars of Frere Jacque on the piano. When we went to see Elton John Saturday night we had grabbed some food at Scholz Bier Garten before the show. For those of you who don't know Scholz's is the oldest beer garden in TX - since 1886. What we didn't know until Saturday night was that they also have some of the best sausage we have had anywhere in town. 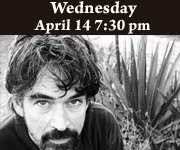 We also saw a sign advertising their Wednesday night free music series starting this week with Slaid Cleaves. So when Jo brought up David's show there was an added bonus to me - sausage and Slaid! We headed back to Scholz's which was right down the street from the concert hall. The outdoor patio was pretty full as we got there 10 minutes before the show but we found some seats in the back that had a little table for us to have dinner on. Slaid has been one of my favorites for a couple of years every since he released his album, "Unsung", which was him singing songs of others that had not been recorded. We went to his CD release party for "Everything You Love will be Taken Away" last spring at the Cactus Cafe and Jo was hooked! The front row seats didn't hurt either, he seems like one of the nicest and most honest guys playing music in town. It was a perfect 70 degrees out with a slight breeze and we had some more of the sausage, a brat and some great fajita nacho's along with a few Dr. Pepper's (only downside is Scholz's serves that other soft drink that I can't mention and not our fine Coke products). Slaid opened with "Green Mountains and Me" from the latest disc and since he is a Maine native this song obviously means a lot to him. He seems so comfortable on stage and his band was Rick Richards on bass and Chojo Jacques on fiddle and mandolin. During the set when Slaid introduced the band he pointed out Rick and Chojo had not met until before the show - that just blows my mind how these guys just can play with anybody and sound great! Next up was "Hard to Believe" from the latest release which is a Midwestern tale that really hits home about the cold winters that I still do not miss. Drinking Days - from the Wishbone CD - just a great song and one of my favorites - as well as Stephen King's about the changes one goes through as you "grow up"
Flowered Dresses = a song by Karen Poston from Unsung - it's just a beautiful song and tells the story of a young person who thinks all the problems between mom and dad are their fault. Wishbone - just a catchy song - still struggle to understand how this great singer of Americana doesn't have a bigger following while other knuckleheads with very few skills sell out much bigger places. The songs are just so good I could sit there and listen to his entire catalog. And then my favorite thing to talk about. At the Cactus show Slaid told the story of a friend of his from Maine who is crazy sometimes and just leaves him messages with suggested song lyrics. One such lyric was "Where can a good man go crazy, where can a cowboy get stoned" and he had written it down in his book. The friend kept talking about it and finally Slaid found a place for it in the song "Tumbleweed Stew." About three months later we were up in KC helping Brittany set up her classroom and I was in charge of organizing her book shelves when I stumble across a kid's book entitled "Tumbleweed Stew". I put the book in my carry bag and have had it in my office for 6 months or so. I brought it with Wednesday night and in between sets when Slaid was signing things I told him the story and gave him the book. 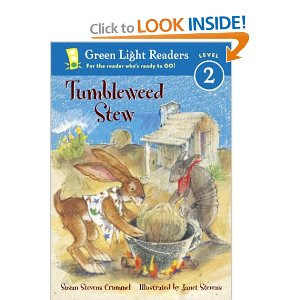 He had no idea there was a children's book named "Tumbleweed Stew" but now he has it for his collection! After an hour set the band took a break and we decided it was a good time to head home after enjoying nearly a dozen songs from one of Austin's best storytellers. If you get a chance check out more details at www.slaid.com and when you hear of Slaid coming to town get out there and see one of the best songwriters you will see anywhere. And then next week we will take a little break from Austin and head to Seattle for the weekend and I hope to catch Jackie Greene at the Crocodile Cafe to sample the Seattle music scene.